“The Bad Specimens” by T.D. Clare is an eerie sci-fi/horror story that will preoccupy you long after the story is finished. Set some time in the future, a large group of humans is taken to a distant planet to be a part of the inhabitants’ experiments. Separated into groups, they are not allowed to communicate with each other. Because of language barriers, most of them could not do so anyway. The capturers think very little of these humans. Their captives’ apathetic behavior is disappointing to them. The humans make very few attempts to try to prevent their mistreatment and just seem to allow things to happen to them. Instead of creating an escape plan, they live with the hope that people from earth will rescue them. Meanwhile, they endure horrific experiments which end up resulting in injuries, death and pregnancies. After a woman gives birth, her child is immediately taken from her. Most of the births do not survive. In time, it is also discovered that most of them are being killed to feed the locals. As the numbers dwindle, there are only a few captives that stand out as being resilient. The survivors continue to hope for a rescue and there are few that find some assistance from an unexpected source. 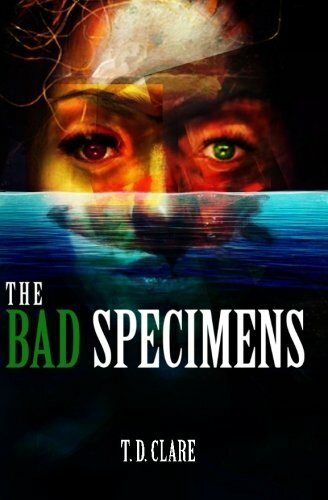 As I read “The Bad Specimens” I couldn’t help but compare the plight of these humans to those of animals on our planet. In both cases, there is no regard for their physical or mental well-being and they end up being used to serve the needs of humans. This thought crossed my mind many times, which made the story even more horrific because we aren’t much different than the capturers. In the story, there was very little evolvement of the characters. They mostly seemed to just allow themselves to decline. This was frustrating to me, but it made it seem more realistic. “The Bad Specimens” by T.D. Clare is an interesting, thought provoking novel. I hope that there is another book to follow this one so that readers can get more answers. The author does an excellent job creating a story that will haunt your imagination. Because of this, I don’t recommend reading it if you are feeling down!